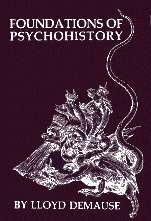 "Neither history not psychiatry can ever be the same again ... a turning point in the integration of the social sciences." - - Reuben Fine, author "The History of Psychoanalysis"
"Confronting, Ambitious, provocative and comprehensive"
The Evolution of Childhood useful for home study (only 212KB). Are the page numbers in the book available? Yes! For referencing ability the original work's page lay out has been retained. Though there is more then one 'text page' on each HTML Page - numbers of text pages have been placed in the same location they would be found in the text; at the top of each 'page' aligned right. How the Chapters devided and why ? HTML pages have a load time - for this reason some of the chapters have been split between more then one HTML page. We have strove to keep each HTML page's load times about 80 seconds. Estimates were made with f/p for a 28.8 modem with the web running smoothly. Plain text loads faster then pictures - so the less pictures the more pages in each section. Why were no diacritical marks included as in the original text? The character/symbol, 'library'/palette I have adhered to is ASCII - PLAIN LATIN - as it is found on all computers. Because of this I have left out special character - like umlauts and so forth. Though these are on most machines today - they are not on all. When they are not they result in the creation of a garbled and unreadable mess. In the original hard copy all words were properly marked. Here - for cross platform readability - they are not. Why the simple web page format? Also I have tried to only use the most basic HTML tags (code). Again so that any machine, (no matter of age or operating system) in the world can read it. HTML 2 was used. I've found errors - how can I have them fixed?